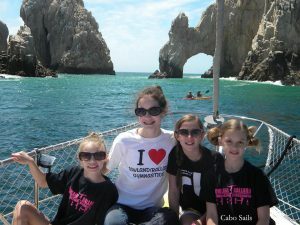 Cabo whale watching tours are certainly one of the most popular activities offered in beautiful Los Cabos Mexico. Because of such an abundance of whales, Cabo is one of the most spectacular whale watching destinations in the world. For instance, each year more than 10,000 whales visit the pristine waters of Los Cabos. The best time to see the whales is mid-December through the end of March with January and February being the peak months. 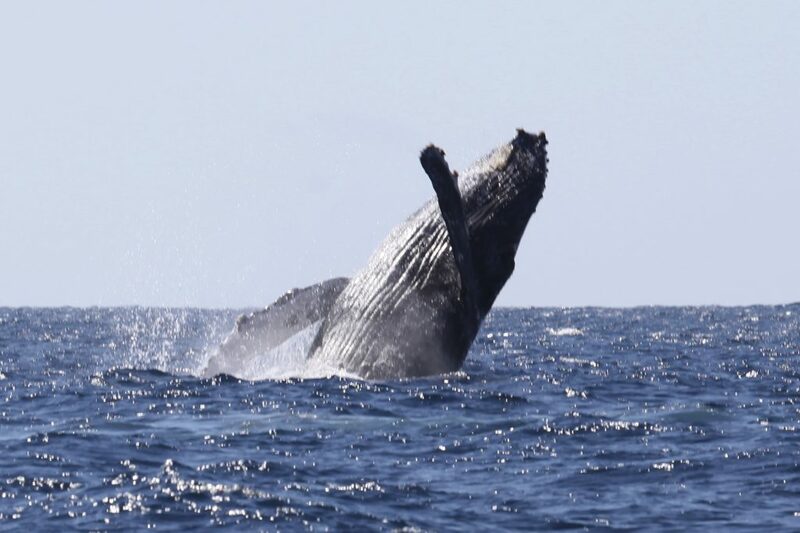 The two primary types of whales you will see in Los Cabos include the Humpback whales (famous for their singing and acrobatics) and Gray whales. In addition, other whales you may see during your Cabo whale watching tour include Blue, Fin and Pilot whales. An extra special experience is to witness the Humpback whales breaching. However, an even more thrilling experience is to observe a mother Humpback and her calf breaching together. Observing these gentle giants is truly an experience of a lifetime. The whales migrate south from their arctic feeding grounds to breed, give birth and nurture their calves. After their long 6,000 mile journey from Alaska, the whales arrive in the warm waters of the Baja California Peninsula which they find a natural refuge. 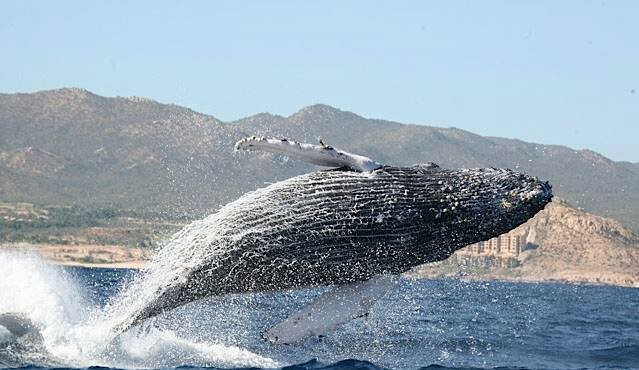 Visitors come from all around the world to see the whales in beautiful Los Cabos Mexico. Once you begin your Cabo whale watching tour, you will depart out of the Cabo San Lucas marina into the Cabo San Lucas Bay. Here you will enjoy sightseeing along the magnificent Finisterra Rocky Point of Land’s End. In particular, you will enjoy seeing Medano Beach, Lover’s Beach, the sea lion colony and Los Cabo’s most famous landmark, El Arco (Land’s End Arch). 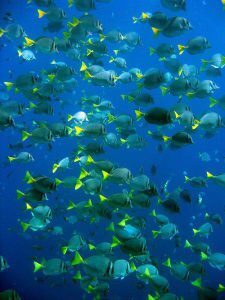 Sightings of dolphins, manta rays and turtles are also special observations. Depending on the day, the whales may be located in the Sea of Cortes or Pacific Ocean or a combination of both. Any time is a good time to see the whales however typically the water is the most calm for the morning departure and there is less traffic on the water. This can make for a more pleasant whale watching experience. 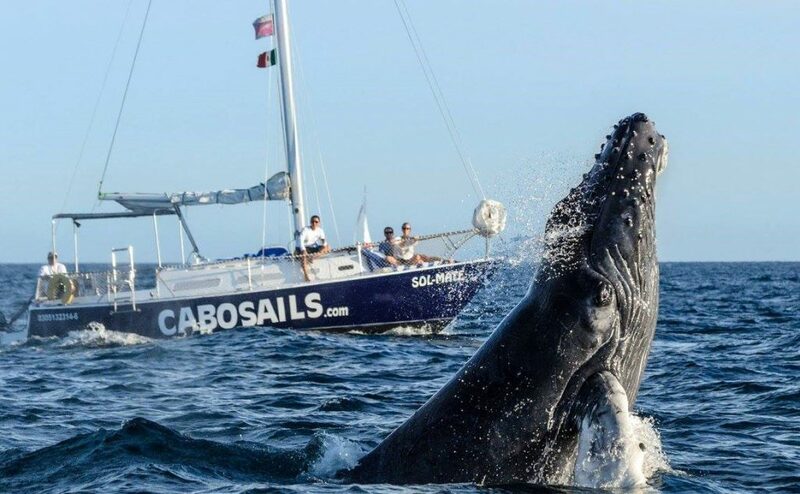 Cabo Sails has been offering guests memorable whale watching experiences for 17 years. You will enjoy private Cabo whale watching tours departing out of the Cabo San Lucas Marina. Tours are offered at 9 a.m., 12:30 p.m. (3 hours) or a 2.5-hour sunset tour departing at 4 p.m. All tours include delicious food, premium open bar and the most respectable, knowledgeable and fun crew. In addition to seeing these spectacular creatures, you will also enjoy a very memorable experience on board your very own private boat. Sightseeing to Medano Beach, Lover’s Beach and the Finisterra Rocky Point are included for all tours. You will also enjoy seeing Los Cabos most famous landmark, El Arco which is the Lands End arch. Parents you are going to love to hear that all children 12 years and younger enjoy all whale watching tours free with up to five children maximum per tour. How cool is that! In addition, we have life line netting all around the decks of our boats for your children’s safety and adults too. We look forward to the opportunity to treat you to a very memorable whale watching experience in sunny Cabo San Lucas Mexico. There is an amazing phenomenon that takes place every 4-5 years in Los Cabos Mexico. This phenomenon occurs when the tide recedes just enough to create a sandy beach around Los Cabos’ most famous landmark, El Arco (Lands End Arch). Some locals feel it is an urban legend that every 4-5 years comes this phenomenon that pulls a lot of sand from the ocean and creates this beautiful scene around the arch. This beautiful sandy beach surrounds the arch for several weeks. El Arco is positioned at the southern tip of the Baja Peninsula where the Sea of Cortes meets the Pacific Ocean in Cabo San Lucas Mexico. El Arco is a spectacular natural arch rock formation that attracts thousands of tourists each year. The arch is normally completely surrounded by water. Tourists who are currently enjoying their vacation is sunny Cabo are fortunate to see this phenomenon taking place right now. Our Cabo Sails guests who are enjoying sailing and snorkeling tours are excited to have the opportunity to see this phenomenon up close from their very own private sailboat. Wish you could charter a private boat with your family and friends in sunny Cabo San Lucas? Just imagine sailing aboard your private boat with your family and friends. It gets even better because you will enjoy the beautiful blue Sea of Cortes is sunny Cabo. The good news is you can charter your private boat with Cabo Sails. Their accommodating crew will provide you with an amazing experience. In addition to offering you one of the most fun experiences in Los Cabos, you are also able to customize your private tour. 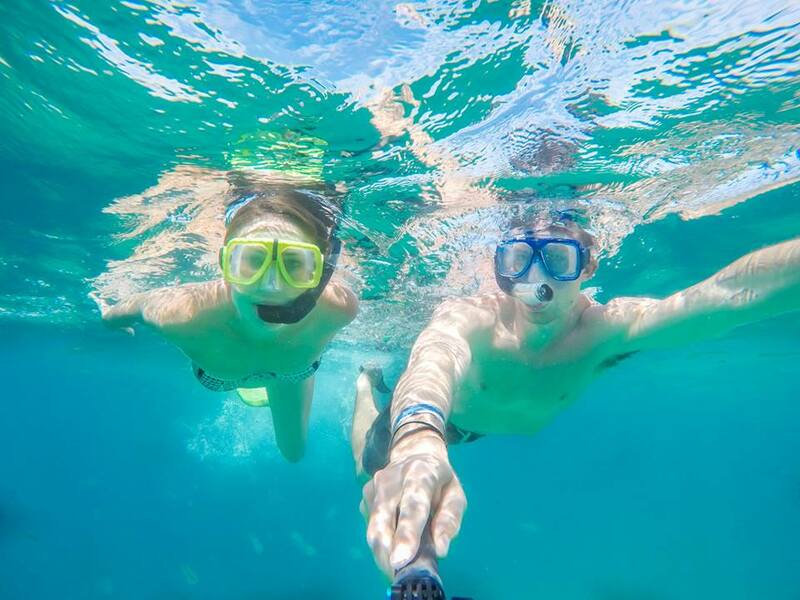 For example, you can enjoy sailing, snorkeling and sightseeing all in one private tour. You also have the opportunity to enjoy these fun activities on your own schedule. Surprisingly enough, a private tour is possible for a very reasonable price. That’s pretty cool! Cabo Sails is also very happy to accommodate your special requests. Feel free to request vegetarian, gluten free and your favorite wine. They are experts in accommodating special occasions therefore also have flowers, birthday cakes and champagne available. Cabo Sails is at your service because you deserve the very best of Cabo. Parents, you are going to love this next detail because some things in life are FREE! Children 12 and younger enjoy all tours FREE! Yes, it’s true! How awesome is that? Remember, up to 5 kids maximum per tour are FREE! Now you know how to charter your very own private boat in sunny Cabo San Lucas. All you have to do is book your tour and be ready to enjoy a very fun experience! 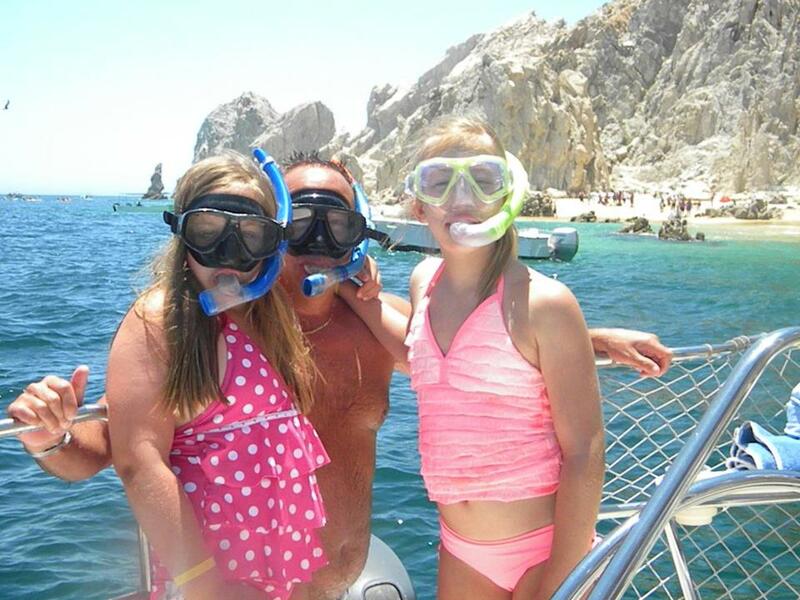 Cabo Sails offers you the opportunity to enjoy your very own private snorkeling tour in sunny Cabo San Lucas Mexico. 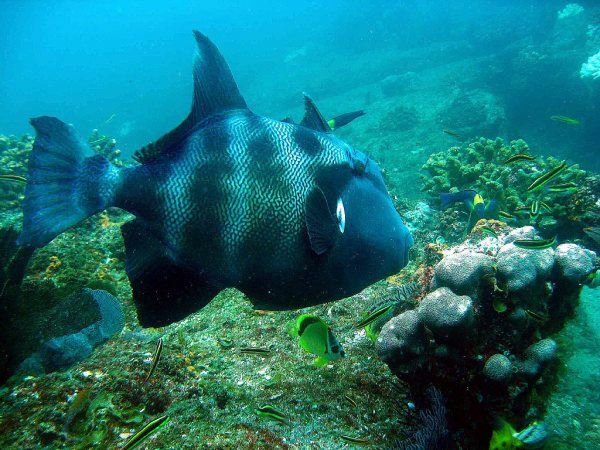 You will enjoy snorkeling at Pelican Rock in the Cabo Bay near Lover’s Beach. Pelican Rock is surrounded by a natural aquarium and is part of the National Marine Cabo Bay Park. 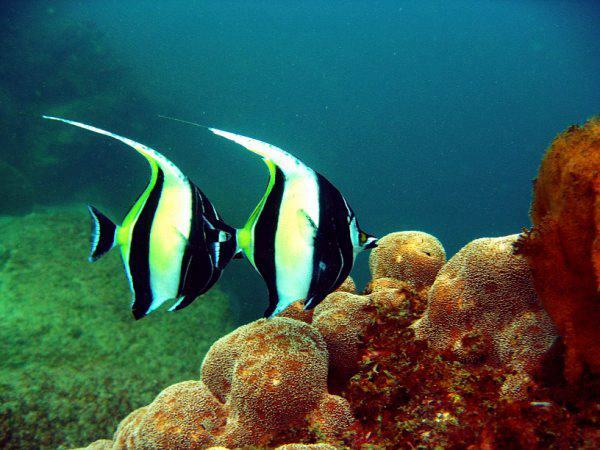 Here you will view an abundance of beautiful tropical fish in this amazing marine sanctuary. 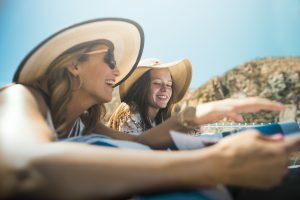 You have the opportunity to choose your very own private sailboat or catamaran which includes our bilingual, knowledgeable and very accommodating crew. You will enjoy our delicious appetizer size beef burritos, cheese quesadillas, Mexican chicken salad, fresh guacamole, salsa, totopos which are all prepared by our chef. 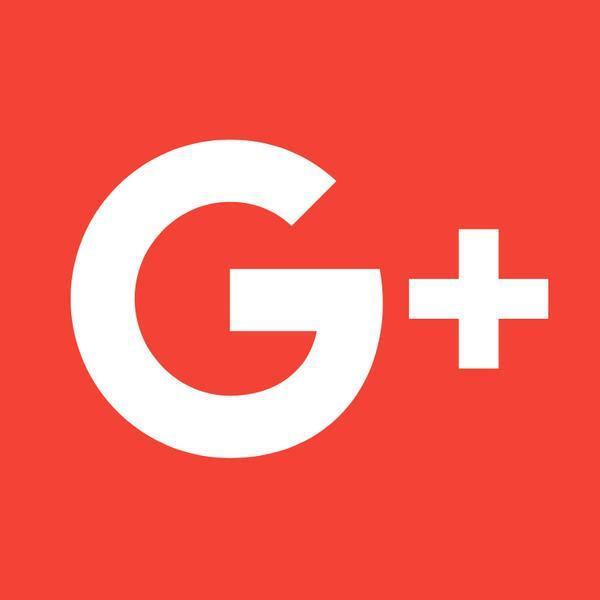 Please let us know if you prefer vegetarian or gluten free and have any food restrictions. Our chef also prepares a tasty fresh fruit and vegetable platter. Open bar includes Bacardi and Captain Morgan’s Rum, Absolut Vodka, Johnnie Walker Red, Don Julio white tequila, margaritas, cabernet sauvignon and sauvignon blanc wine, sparkling wine, Pacifico, Corona, sodas (Coke, Diet Doke, Sprite, Fresca), juices (orange, cranberry, Clamato) and bottled water. Equipment is provided for guests 7 years and older. Life vest are provided for guests 3 years and older. You will have the pleasure of viewing the spectacular scenery of the Finisterra rocky point of Land’s End where the Pacific Ocean meets the beautiful blue Sea of Cortes. You will also enjoy seeing Lover´s Beach, the sea lion colony, El Arco (Land´s End arch) and Medano Beach all from your very own private boat. 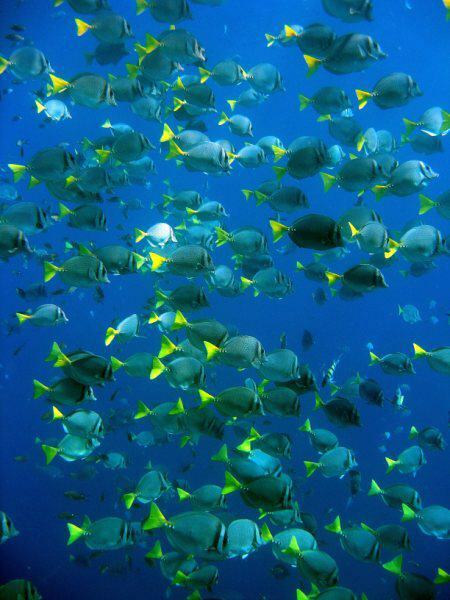 Our Cabo Sails team are experts in the ecological wonders of the Sea of Cortes and Baja California. We look forward to sharing our knowledge about the sea life, marine mammals and seabirds. We look forward to treating you to an amazing experience in sunny Cabo! 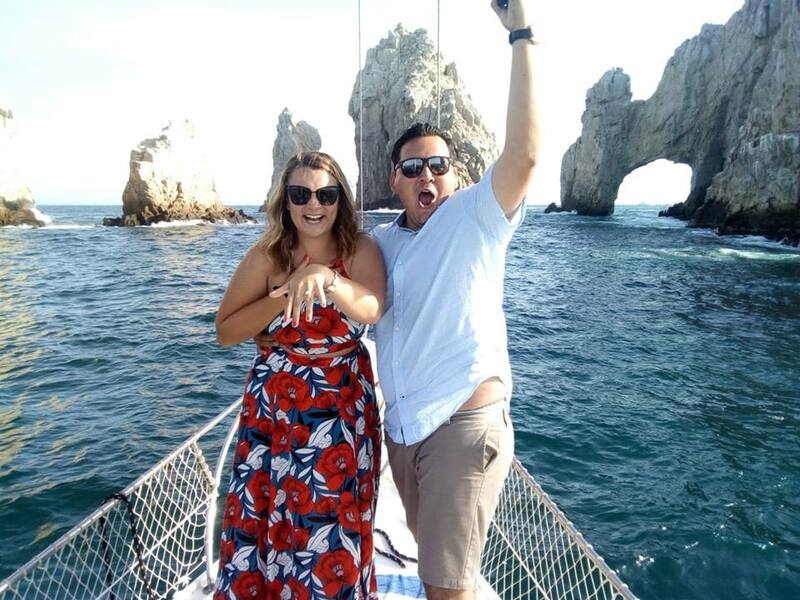 Congratulations to Christopher & Makena who were engaged yesterday in romantic Cabo San Lucas. 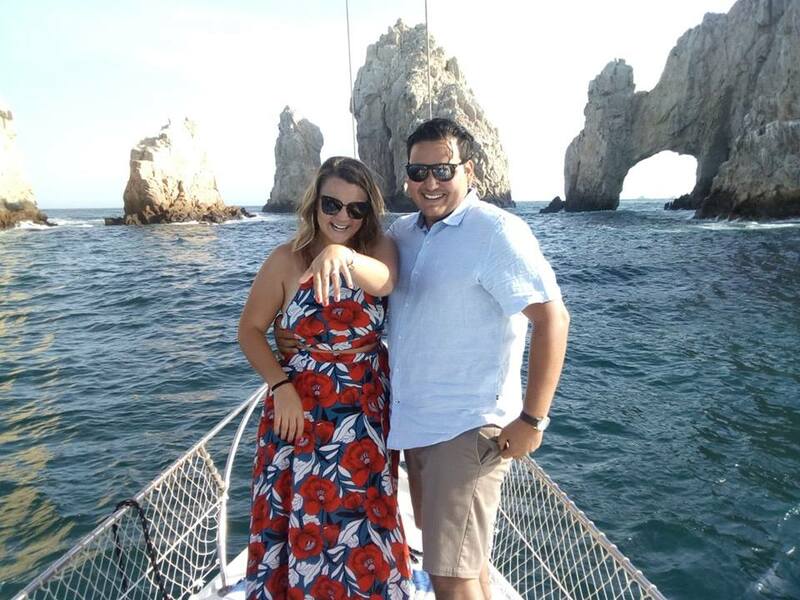 We are honored you choice Cabo Sails for your special occasion and wish you both a lifetime of happiness. Cheers from your Cabo Sails amigos! Cabo Snorkeling is a very fun experience! You will enjoy snorkeling at Pelican Rock which is surrounded by a natural aquarium and is part of the National Marine Cabo Bay Park. 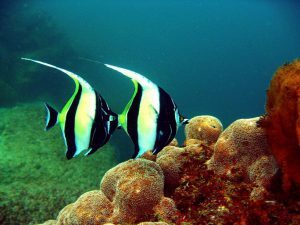 Here you will view an abundance of beautiful tropical fish and marine life in this amazing marine sanctuary. We love to create memories of a lifetime for you and yours in beautiful #Cabo San Lucas. 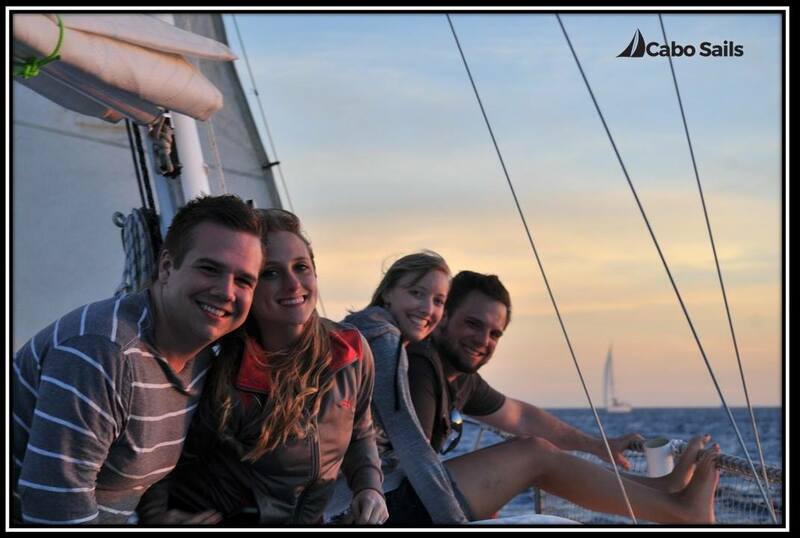 Prepare to be pampered during your private #sailing & #snorkeling tours with our amazing crew! 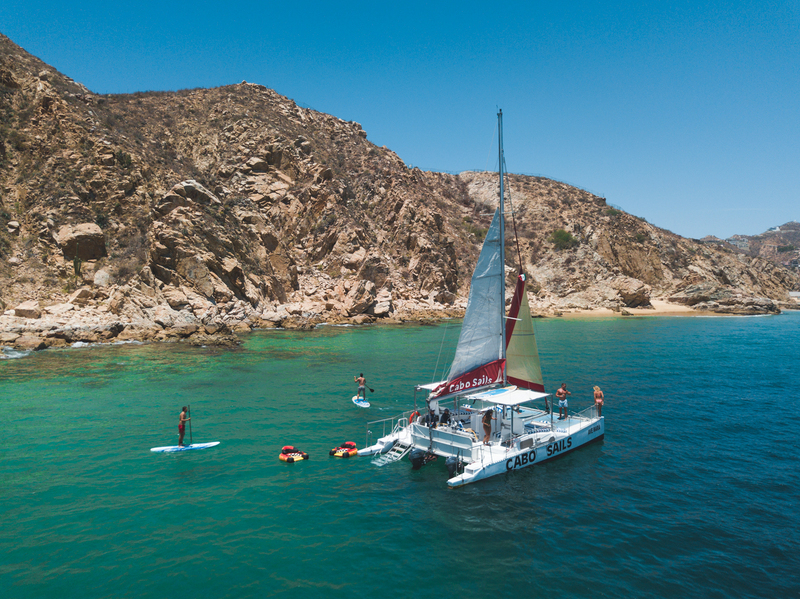 We begin our day bright and early in sunny Cabo San Lucas Mexico preparing our sailing fleet for our guests to set sail and enjoy private sailing, snorkeling, sightseeing, whale watching and sunset tours. 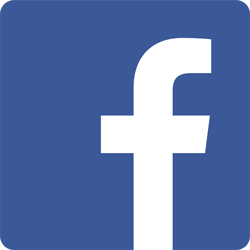 We love, live and breathe Cabo and therefore have a lot to share and helpful local tips to enhance your vacation experience in Los Cabos Mexico. 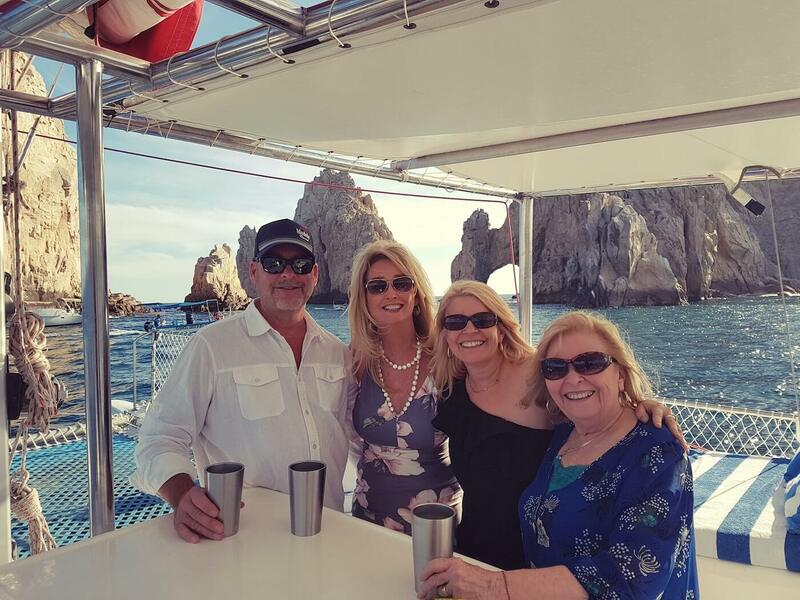 Enjoy memories of a lifetime with the amazing Cabo Sails crew aboard your very own private boat in sunny Cabo San Lucas Mexico! We treat you to delicious food, premium open bar, snorkeling fun, sailing and our fabulous Mexican hospitality! 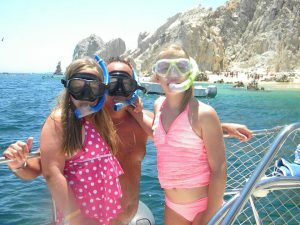 We specialize in creating memories of a lifetime in beautiful Cabo San Lucas. Enjoy our private tours & feel the warmth of Mexico with our amazing crew!